Nate's Restoration specializes in high quality auto detailing, interior restoration, and auto appearance protection product application. We offer expert automotive interior restoration services and recoloring, quick wash, basic, standard and deluxe auto detailing packages, as well as commercial make ready and fleet services. Eco-friendly NatureShield products/services include Paint Sealant, Leather and Vinyl Protector, Fabric Protector, and Undercoat. Your vehicle looks new again and our products keep it looking that way. 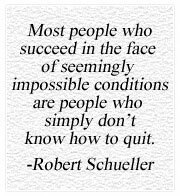 We help you keep one of the biggest investments of your life in top resale shape for years to come. Pride of ownership is a big part of the enjoyment of owning your vehicle. 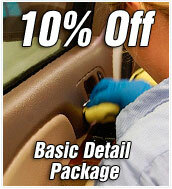 We put the "detail" in auto detailing, making your car perfectly clean inside and out. When you drive a clean new-looking vehicle you command a special place on the road, a place of pride and enjoyment. Our expert automotive detailing products are designed to deliver the best possible quality and beauty. We use eco-friendly NatureShield biodegradable commercial automotive appearance and protection products to achieve top quality shine and protection while being easy on the environment. How do you want your car to look? We make it look more beautiful and newer than it has since it left the showroom. A clean, well protected vehicle lasts longer, retains value longer, and is more enjoyable to drive. Bring your vehicle to Nate's Restoration for complete auto detailing, polishing, and protection. 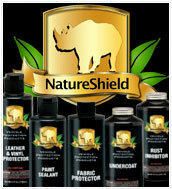 Ask us about NatureShield's leather and vinyl protector, paint sealant, fabric protector, and undercoat. Protect your vehicle from the environment with NatureShield appearance and protection products from Nate's Restoration. Dealers and fleet managers, contact us about your commercial vehicle appearance needs. We have been serving the automotive sales industry since 1988.